Lauren has worked within the travel and hospitality industry for the past 10 years and has specialized in community management, social media and content marketing, influencer programs, and event coordination. She's been part of the White Stone team since October 2016 and loves contributing her skills and passions while learning all about this particular niche of the industry. 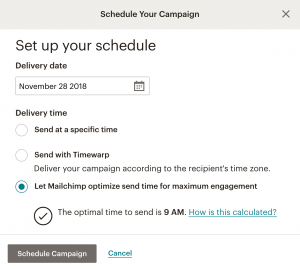 If you are not currently on our email marketing program or ever need to send an email off the campaign calendar, we recommend the following simple tips in the form of Dos and Don’ts to make sure you’re staying on brand and not spamming your readers. This is meant for clients who know how to navigate Mailchimp already. If any part of this list requires further explanation or instruction, please join us for our upcoming Mailchimp webinar. The subject line, preview text, and from name are extremely important as these all influence open rate. First name(s) + property name is the best formula for the default from name (eg. Wendy at Washington House Inn). Add some personalization to your subject line using *|FNAME|* to automate your subscriber’s first name. Add a fun and appropriate emoji to help your subject line (or preview text) stand out. Make your subject line and preview text catchy with a CTA (call to action). Add punctuation after *|FNAME|*. If the first name isn’t in the system, it’ll show up as a an extra space so a comma or dash could look like a typo. Go crazy with emojis. No more than one or two. Start with the CREATE button to design a new campaign. Make sure all the photos are 633 pixels wide (height doesn’t matter, but try to keep it consistent throughout). Use the same fonts and colors designated in your template. Keep the design as simple as possible. The average time spent in an email is 8 seconds, so keep that in mind when deciding how much information you want to include in a single blast. Link over to your website in every section (photo, button and any relevant text). Make sure you include clear calls to action. Make it fun! Jazz up the headlines and button language. Duplicate a template to start a campaign. And don’t make changes to a template, unless to change something default such as a phone number update, etc. Use red color for fonts if it’s not part of your template. Overload with text and/or too many promotions. Remember, 8 seconds. Link to a site that isn’t yours (if you can link it to your own; we know sometimes this isn’t possible). Your email is ready to go, but there are steps needed before and after it’s sent. Test, test, test! Send yourself a test email. Read through once more and click on all the links to make sure they load properly. Ask yourself if you can skim and consume everything within 8 seconds. It’s especially important to review on your mobile device since ~60% of your subscribers open your email there. Send at the optimal time (we recommend Tuesdays, Wednesdays, and Thursdays). 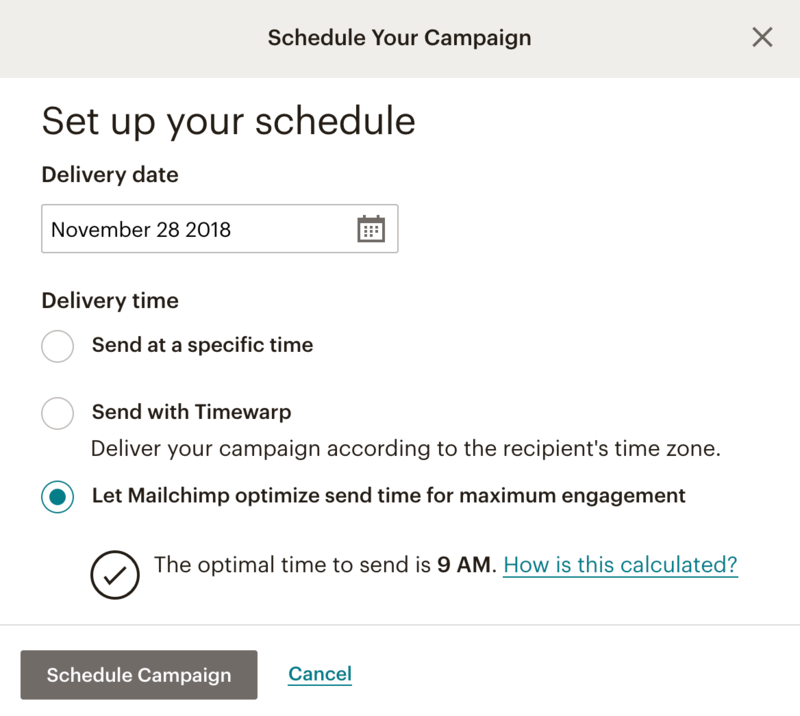 If you have a paid Mailchimp account, there is an optimal send time option that you can use to schedule at the best time on the date you choose. Resend the next day ONLY to subscribers who were sent the campaign, but did not open. Resend the same campaign to the entire list (segment!). Send more than one campaign a week to the same list. Still have questions? Don’t hesitate to reach out to your client rep or send Lauren an email at laurenn@whitestonemarketing.com. We will be hosting a Mailchimp webinar on December 6th at 11am PT/2pm ET so bring your questions or send them over to Lauren in advance so we can make sure we address them. Mark your calendars and join us on Zoom. The above are just the basic tips for setting up a solid email. There is much more that goes into every campaign as far as strategy, design, and testing. If you’re not currently a campaign client, but are thinking about leaving your email marketing efforts to the pros, see some examples of the work White Stone is doing and if it’s the right fit for you.